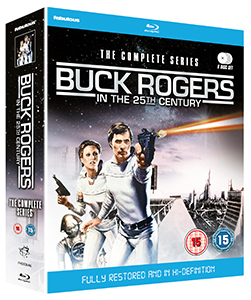 For our second day of our Christmas giveaway with Fabulous Films, we’ve got a copy of Buck Rogers in the 25th Century: The Complete Series on Blu-ray to give away. Sit back and enjoy all 33 episodes across 2 seasons of this timeless sci-fi classic, now fully restored and in high definition. The year is 1987 and NASA launches the last of America’s deep space probes. Aboard this small starship is a lone astronaut, Captain William Buck Rogers. In a freak mishap Ranger 3 and its pilot are blown out of their trajectory into an orbit which freezes his life support system and returns Buck Rogers back to Earth 500 years later. He is forced to readjust to a new world and its people – who blame his generation for a nuclear holocaust which left the earth a radioactive wasteland. Buck is soon enlisted to help save the Earth from an alien threat, working with Colonel Wilma Deering and a robot-droid known as Twiki. They roam space and planets to welcome back the lost and dispossessed. The competition closes at 23.59 (GMT) on Monday 17th December 2018.